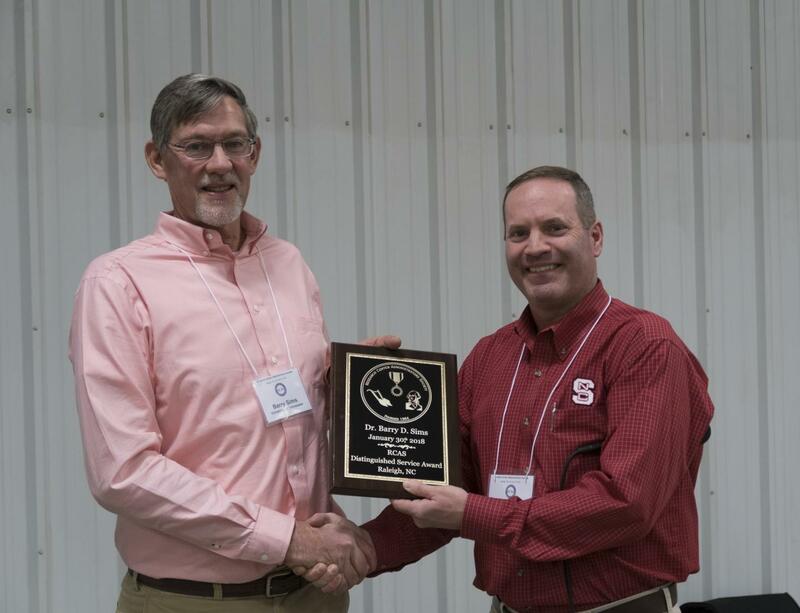 RALEIGH, N.C. – The Research Center Administrators Society has honored past president Barry D. Sims, associate director of University of Tennessee AgResearch, with its Distinguished Service Award. RCAS President Jeff Chandler made the presentation to Sims on Tuesday, Jan. 30, during the association's annual winter meeting. Sims served as RCAS president from 2016-2017 and also served as former president of the Southern Weed Science Society. "Barry has been an energetic proponent of the land grant mission and has a deep understanding of the research that's needed and the benefits it has, not only for the ag industry, but the nation as a whole," said Chandler, wo is director of the Mountain Horticultural Crops Research and Extension Center at North Carolina State Extension. Sims was named associate director of UT AgResearch in 2016 after 18 years as center director of the Highland Rim AgResearch and Education Center in Springfield, Tennessee. As associate director he oversees the system's 10 centers and coordinates faculty research at the centers. Before joining UT AgResearch, Sims worked for the University of Missouri as an extension specialist and as a field research biologist in the private sector. Sims is currently the national president of the Research Center Administrators Society and a former president of the Southern Weed Science Society. Sims earned his BS in Plant and Soil Science from UT-Martin, his masters in plant and soil science/weed science from UT and his PhD in agronomy and weed science from the University of Arkansas. A native of Tennessee, Sims grew up on a farm in McNairy County. He and his wife, Amy, have three sons. To learn more about RCAS, visit http://www.thercas.org/.